This is our 11th year of creating a special and unique H.B. Provisions Prelude Mug. This mug is sure to add the Christmas spirit to your home and table. Get one for your self or for a friend as a reminder of the joys of Christmas and H.B, Provisions! Add to your collection or begin your own personal collection now! A Taste of Maine Gift Box, the perfect gift for friends and family! This Taste of Maine gift box is a treasured gift for friends and family and what better way to say Merry Christmas than with a little taste of Maine!. 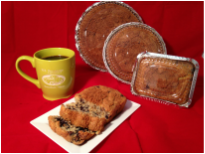 Our gift box contains an HB Provisions wild Maine blueberry coffee cake and 12 ounces of HB Provisions, Bonnie's Blend coffee. The HB gift box will make an wonderful breakfast treat or a satisfying afternoon snack. This is one gift that will be requested year after year! **We have Annie's Gluten Free Banana Cake with Chocolate Chips that comes in the rectangular pan which serves 2 generous portions. We are also happy to make a custom gift box with any of our assorted goodies we have in the store. Now you can take HB on the go with our high quality stainless steel travel mug. Made to insulate your warm or cold drinks and fits in most cup holders as well for added convenience. Enjoy your own HB Provisions travel mug with our vibrant picture and hashtag. The water color painting was created by local artist, Peter Hoff and has been used on many of ourspecialty HB products. Bring that special reminder of time spent in our delightful general store home with you! Artwork is foudn on both sides of the mug too! This high quality, heavy white long sleeve T shirt shows off our logo in a smart and stylish manner. The large logo covers the back of the shirt and the smaller logo sits on the left chest. Perfect for taking the chill off on those cool summer nights or adding as a layer in the winter! A great souvenir or gift for yourself or others. The pictures don't show that these t shirts are bright white. This high quality, heavy white T shirt shows off our logo in a smart and stylish manner. The large logo covers the back of the shirt and the smaller logo sits on the left chest. An excellent choice for summer wear whether you are in Kennebunk or elsewhere! A great souvenir or gift for yourself or others. The pictures don't show that these t shirts are bright white. Enjoy your coffee in style with our handsome H.B. Provisions Coffee Cup. Stylishly designed for comfort and use with our name and logo etched against the bright color of the mugs. Choose your color and have that reminder of your favorite general store with every cup of coffee*. * Can be used with hot or cold drinks and not just coffee!! Want to put a smile on your friends face? How about please your husband, wife or child? What better way than with an H.B. Provisions gift card. Whether you are after a coffee and donut in the morning, a nice hot lunch in the afternoon or a bottle of wine with cheese and crackers for your evening delight the Gift Card will be sure to make everyone on your Holiday list happy! 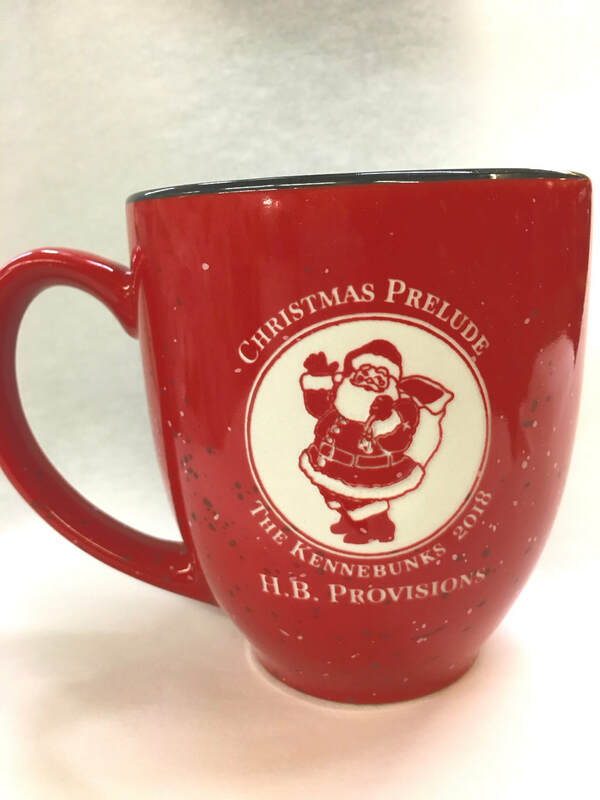 An excellent gift or a nice way to enjoy our coffee all year long! We have our own coffee roasted right here in Maine. A favorite coffee for locals and visitors alike with many flavors to choose from. Bonnie's Blend is a rich dark roast. Just Regular is, you know, just regular - a nice medium roast. Of course the flavors are all delicious and the HB Decaf is a nice dark roast as well (this is what Bonnie drinks!). Choose which coffee you would like and be sure to let us know if you want it whole bean or ground. Which coffee do you want? A fun selection of colors in our new supply of HB Provision Caps! Our HB Provisions cap is a wonderful addition for any hat collector or perfect or an everyday hat! Show you are a fan of HB Provisions and wear our cap with pride!